How much medicine does my child need? Babies under 3 months should be seen for fever over 100.4F. They should not receive any medicine for fever until seen by a doctor. 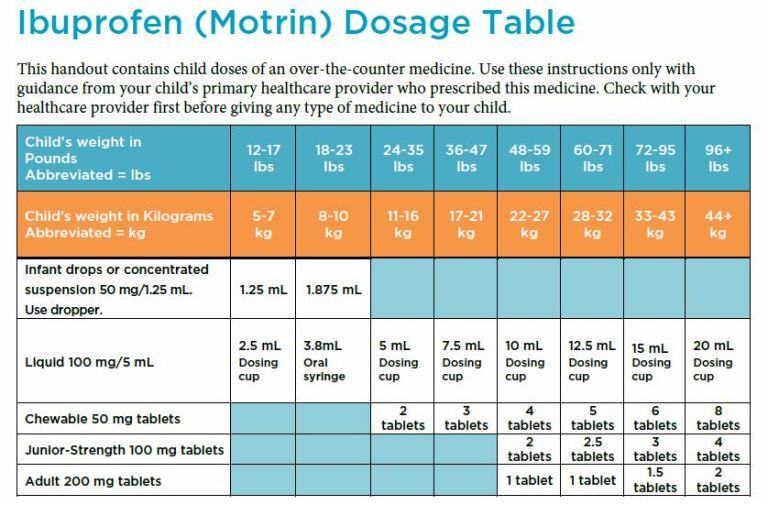 No ibuprofen (Motrin, Advil) for children under 6 months. Always follow the dosing guidelines according to WEIGHT, not age. Use syringes and droppers for measuring, not teaspoons or kitchen spoons. 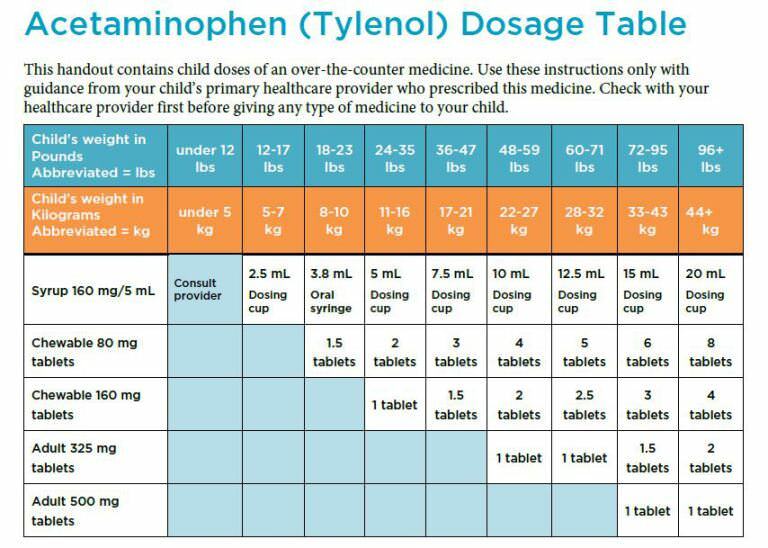 You may repeat doses of THE SAME medicine every 6 hours and then stagger, so that your child is getting one medicine every 3 hours. (For example, Tylenol at 12PM, Motrin at 3PM, Tylenol at 6PM, Motrin at 9P.) Don't give either medicine more than 5 times a day. Be careful with over-the-counter flu and/ or cold medicines. These often contain Tylenol or Motrin and can lead to double dosing. Call your doctor if fever persists >48 hours, your child becomes weak or unresponsive, your child is unable to drink and/or is making less than 3 wet diapers a day. Do not give Benadryl more than every 6 hours. Do not give to children under 2 years of age without speaking to a healthcare professional first. NEVER give to any child under 1 year of age. As with Tylenol and Motrin, dose according to WEIGHT, not AGE. Do not give with other cold or allergy medicine unless instructed by your doctor, as the combination can cause too much drowsiness. While most adults get drowsy with Benadryl, this medicine may cause kids to become quite hyper. If your child is flushed, coughing, drooling, or having difficulty breathing, call 911 and proceed to the nearest emergency room. When can my child return to school? Your child may return to school when they are fever free (temperature less than 100.4F) and have no vomiting for 24 hours. They must also have had 24 hours of any antibiotic that was written by your doctor. A fever is defined as any body temperature greater than 100.4F. This means that temperatures of 99-100, while above normal body temperature, are NOT a fever. For babies under one year, rectal temperatures are preferred. For older children, oral or ear temperatures are best. Forehead and axillary temperatures are unreliable. It has been shown that parents and healthcare providers are unable to determine if a child has a fever based on touch alone, so if you suspect your child has a fever, please use one of the methods mentioned above to confirm. Please do not add or subtract any degree when reporting your child's temperature, regardless of method used. Note: Any child under 3 months of age with a fever needs to be seen by a healthcare provider. When should my child come in for a check-up? Does Shoals Pediatric Group admit to a local hospital? Yes, all four pediatricians at SPG admit sick patients to Eliza Coffee Memorial Hospital in Florence, AL. We do not cover the newborn nursery, but are happy to see your baby after discharge. We do not admit to any other local hospital, so if your child is sick and needs to go to the ER, please take him or her to ECM so that we may see your child if he or she needs to be admitted. What should I do if my child is throwing up? Almost all cases of vomiting will resolve on their own, without over-the-counter or prescription medication. The most important thing for you as a parent is to ensure your child is not becoming dehydrated. Please click on the link here to see the MINIMUM amount of fluid your child should be drinking per day in order to stay hydrated. You may try ice chips, popsicles, water, Pedialyte, milk, and/or sports drinks to keep your child hydrated. If your child is under 1 year, he or she should continue to drink formula or breastmilk and Pedialyte only. Please call our office immediately or bring your child to the ER if he or she can not keep down any fluid, is not answering questions or waking up appropriately, and/ or has not urinated or made any wet diapers in over 8 hours. If your child is under 3 months and throwing up, he or she needs to be seen by a healthcare professional immediately. Can my child take cough syrup? 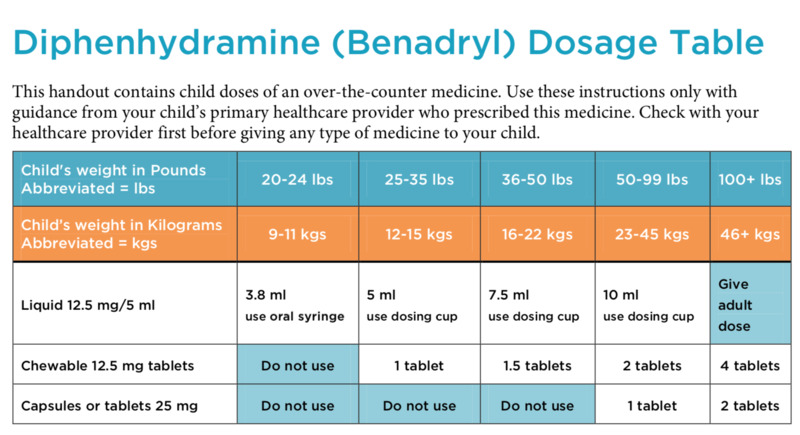 Over-the-counter cough medicine is not recommended for children under 4, per the AAP. For children between 4 and 6 years old, please ask your doctor before using. Remember, these medicines need to always be dosed according to WEIGHT, not age. Please see the link below for other at home remedies, when to worry, and expected time course for colds.